The magnifience of this home will put you in complete bliss! 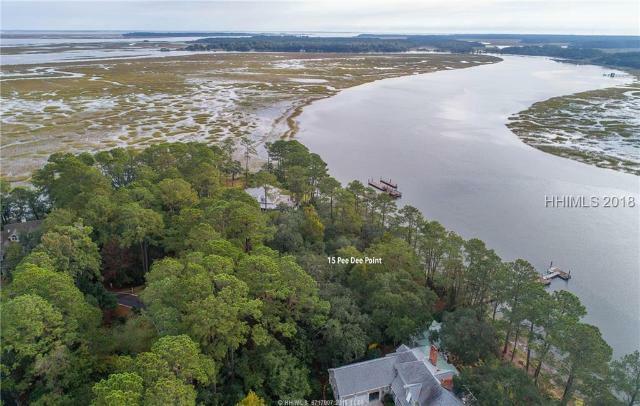 Located in the private neighborhood of Pee Dee Point, on the esteemed Dataw Island, this home is situated on an impressive deep water property just under one acre, with approximately 180 feet along Jenkins Creek. 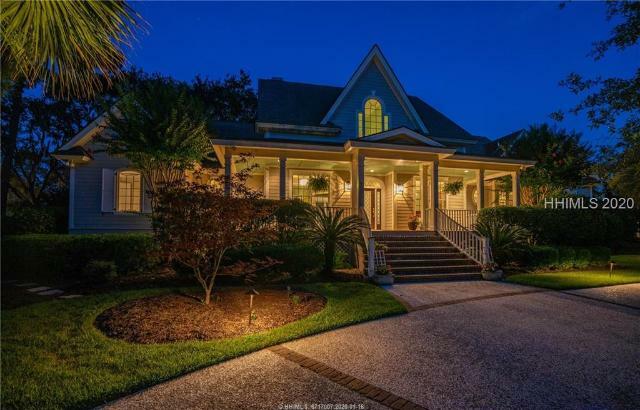 This grand, Lowcountry style home, will welcome you from the moment you enter the driveway. As soon as you step inside you will be greeted by the beauty of Jenkins Creek from the large windows. This home features a gourmet kitchen, 3 masonary fireplaces, a spacious master suite with spa bathroom and ample closet space, two guest bedrooms with bathrooms, and a guest house. ELEGANCE ABOUNDS INSIDE AND OUT of this beautifully landscaped and stately home! At first look you will see the jaw dropping grounds complete with up-lighting. Enter in the front door and enjoy gorgeous views from the large Anderson windows in every room. Formal living room,study and formal dining rooms give way to a gracious great room complete with a wet bar featuring a subzero dual temperature wine cooler. Enjoy cooking in this kitchen with Bosch appliances as everyone gathers in the large family room. The open floor plan is perfect for entertaining! Generous Master Bedroom is on the first floor as well as a guest suite with bath. Morgan River deep water home with newly built private dock and new float lift is ready to welcome you to the Low Country. Home is set under magificent Oaks. Enjoy Ace Basin views and colorful sunsets. Beautful two story Foyer and Great Room flows into a cathedral ceiling Dining Room and wonderful open Kitchen. Expanded extra living space on back screened porch, first floor Master Suite overlooks the river. A study completes the first floor. Twin second floor suites shared with sleeping porch present stunning river views. 18 Sparrow Next recently underwent extensive remodeling. Breathtaking views & luxurious living only begins to describe this gorgeous four bedroom four & one half bath Dataw Island home. Situated along Jenkins Creek, you will enjoy amazing sunrises & welcoming breezes that waterfront living provides. This home boasts a floor plan perfect for easy entertaining. Recently remodeled with all the extras, hardwood floors, crown molding, large glass doors & windows, kitchen is open to a large family room, granite counter tops, stainless appliances, custom cabinetry. There are double master bedrooms on the first level each with their own bath. On the second level you will find two large bedrooms & bath. Enjoy gorgeous views across what golf course designer, Tom Fazio calls ''His Pebble Beach Golf hole'' and Jenkins Creek . This fabulous home is tucked away in desirable Doe Point, a part of Dataw that offers larger homesites and more privacy. This is a 4 bedroom, 3 -+ bath home that includes a true guest suite with private bath, living area complete with a fireplace, private entrance plus a bonus room. Some features include wood floors, high ceilings, open kitchen, solid surface countertops, stainless steel appliances and lots of large windows. Membership in the Dataw Island Club is required. Chandelier in dining room does not convey. Spectacular Dataw Island home with gorgeous views of the water and marsh of Jenkins Creek. Located along the fairway of hole #8 of the Tom Fazio designed Cotton Dike course. A private cul de sac, it is a short walk to the club house, tennis courts, pool, and amenities.The home faces south to catch the prevailing breezes and the manicured gardens and live oak provide shade and tranquility. 205 Odingsell has been meticulously maintained and features a large first floor master suite with 13 ft ceilings. There are two other bedrooms and a large flex/bonus suite above the garage with a full bath. Incredible sunrise and sunsets across the spartina grass fill the windows of this marsh water view home like a painting. The Living room,kitchen and gathering room lead to an open deck and screened porch making entertaining a breeze. Split bedroom plan in this primarily single story home. The owners suite enjoys a marsh vista through a bay window. This cul de sac is close to the entrance gate and Clubhouse, gardens and ruins. Kayak from your own rear yard. Many efficient features such as corrugated hurricane shutters, 40 year roof, high efficient HVAC equipment, whole house vacuum, Anderson doors and windows, and built in sound. 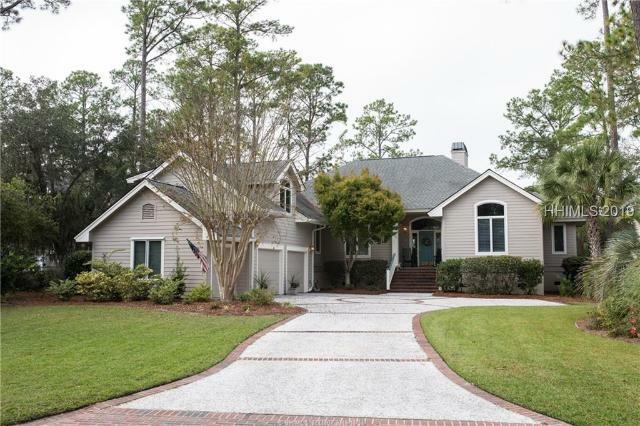 Exceptional Dataw Island home w/ expansive water views of Jenkins Creek across the fairway of Cotton Dike #18. Open floor plan makes for easy entertaining. A spectacular update a few years ago offers a delightful kitchen w/ granite countertops, stainless steel appliances, Kraftmaid cabinets & wood floors. The master suite has a sitting area overlooking the fabulous golf & water views and the master bath has heated tile floors, jetted tub, separate shower and large walk in closet. Incredible heated and cooled area attached to the home could easily be developed into your dream space for an art studio, private guest suite, yoga or dance studio. Located on prestigious Doe Point-a quiet cul-de-sac, and across from a designated green space, this 3 bedroom 2 -+ bath Dataw Island home is waiting for you to make it yours. Beautiful long views of the marshes and Jenkins Creek across the Cotton Dike Course #18 from almost every room. Wood-Mode cabinetry in the large kitchen with center island provides an abundance of storage. Large family room with gas fireplace and wet bar leads you to the Carolina room. The Master bedroom suite includes two walk-in closets and bathroom with jetted tub and a shower. Large bonus room over garage. 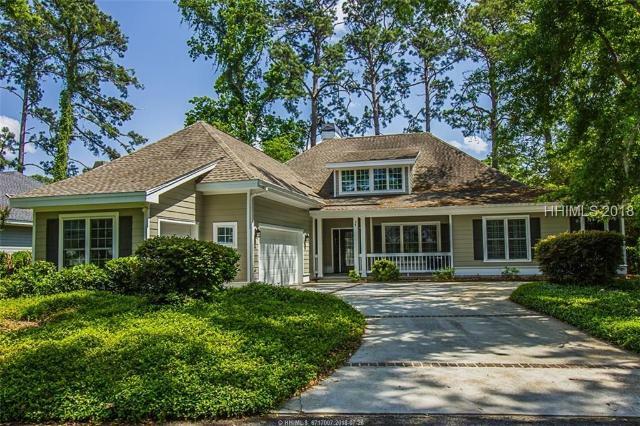 Be the next owner of this Lowcountry Style home. Attention to detail is an understatement, from the amazing custom molding throughout the home to the wide plank hardwood floors. Nestled among hardwood trees you are greeted with a magnificent tabby front porch that run the entire length of the home. This modern open floor plan caters to the owner with a large master suite and spa like master bath. The kitchen is open to the great room and offers stainless steel appliances, granite counter tops, lots of cabinets and a large center island for easy entertaining. With expansive views of Cotton Dike #17 and Jenkins Creek and located on nearly half an acre in the desirable neighbor of Doe Point on Dataw Island, this 3 bedroom, 3 bath home is a must see! Features include beautiful heart pine floors, a gas fireplace, solid surface kitchen countertops, and stainless steel appliances. Relax on the nice size enclosed porch or the rear deck and enjoy the natural beauty and wildlife of Dataw Island. Membership in the Dataw Island Club is required.